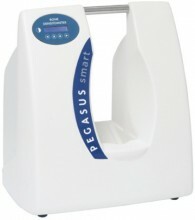 The Pegasus Smart is a portable, easy-to-use, fast and efficient solution for screening and monitoring osteoporosis. Featuring the most recent technologies available on an ultrasound device, the Pegasus Smart estimates bone strength of the heel bone, a site well correlated with the femur/hip bone. Our complete software package has been developed to make administering exams easy, fast and efficient. Exam time < 1 sec. Click the button below to add the DMS Pegasus Smart Ultrasonic Atomizing Bone Densitometer to your wish list.